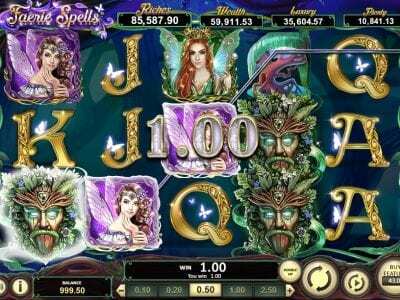 Welcome to the Faerie Spells slots reviews. In this review, we will discuss the pros and cons of playing this online slot machine for real money. First of all, BetSoft releases this five reel, ten pay line video slot game in early 2019. Along with big chances to win, comes captivating animations and beautiful 3D graphics. This Magic / Fantasy themed slot machine features four jackpots plus a high return to player percentage (RTP). As you enter the enchanted forest you can spin the reels with the chance to win money instead of taking a stroll down an actual forest and getting dirty. According to the official BetSoft website, this 3D slot machine has a 96.03% return to player (RTP%). Before you start to spin the reels, you will need to select how much money you want to wager. First of all, choose how many coins you want to play with. After that, you can select anywhere from one up to ten pay lines to gamble on. Once you make your selection, click on the “Spin” or “AutoPlay” button. As a result, you are on your way for an adventure to discover secrets and hidden treasures in this 3X5 video slot. In this game, you will see woodland spirits brew potions in the shadows, but let that scare you. Remember, you can use any toadstool to hide your hoard of treasures. 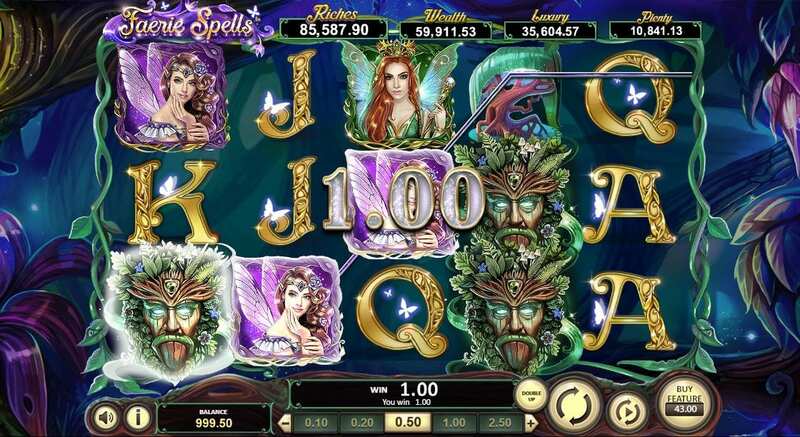 The Faerie Spells Slot machine provides a very nice alternative to modern fairytales. Ultimately, the three-dimensional symbols on the reels paint a beautiful picture of the regular world as it becomes an enchanted planet filled with wealth and luxury. As you see Faeries and Pixie Princesses on the reels, look out for the wild symbol, which is the tree guardian that have green beards. Additionally, you will see magical trees glowing and will o’ the wisps. If you get lucky, you may meet the ruler of the realm, which is the Faerie Queen herself. As a result, you can score two completely different features based on her aura. That’s right, all you need is her aura to reveal the riches of multipliers that can increase your betting bankroll. When you land three or more of the Faerie Queen wilds, you trigger one of the four jackpots. How Can I Win Money Playing The Faerie Spells Slot Machine? The betting starts with as little as one penny. If you feel comfortable, you can increase your wagers up to five dollars per pay line. With ten pay lines to bet on, the maximum you can wager per spin is fifty dollars. If you want a chance to win big money, you will discover the hidden workshop in this Faeie Queen slot. Ultimately, this is on a special playing feature and can trigger one of the jackpots. Additionally, you can collect a special potion, which allows you to win up to 25 free spins. Each of the potions contributes to one of the four jackpots. Remember, the Faerie Queen makes the recipes by mixing her potion. As a result, each of this potion makes up one of the 4 jackpots. First of all, she has four potions she can mix up, which are a magical shower, Luxury, Wealth, and the Spells of Plenty.